How to Clean a Warehouse- Bortek Industries Inc.
It’s an especially difficult task to begin if your warehouse happens to look like no one has touched it in in thirty years. And the longer you wait, the bigger the mess and the more you’re tempted to keep putting it off. But realistically, putting off cleaning a warehouse is not a viable solution. For reasons we’ll briefly examine, keeping your warehouse clean should be on of your top priorities, if it isn’t already. As you’ll see, the secret to getting a clean warehouse is working smart, not hard. It might not be the most glamorous job you have, but it is among the most important. A dirty warehouse puts your employees at risk by introducing inconsistencies to the work environment. 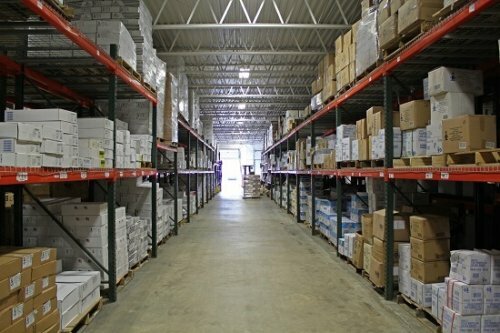 A safe warehouse is one that has everything where it is supposed to be. Drivers can expect clear lines of vision, no debris in their lanes and no employees suddenly slipping in front of them. 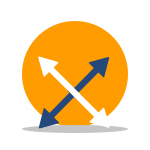 Employees on foot can expect a workspace free of tripping hazards and swerving forklifts. Keeping your warehouse clean can go a long way to making these things a reality. 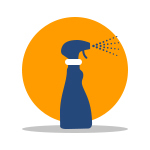 Everyone knows slick oil spots pose a very real risk to worker safety, but other less obvious lapses in cleanliness can be just as dangerous. Scraps of cardboard on the floor can cause a fall just as easily as an oil slick. Overflowing trashcans are tripping hazards waiting to happen. Unmitigated clutter can compromise forklift drivers’ visibility. A dirty warehouse is not a safe one. A dirty warehouse is not only a dangerous place to work, it is also a less than an ideal place to get work done. A warehouse with debris all over the place simply doesn’t run as smoothly as one that has rows upon rows of clear aisles. Additionally, employees are much more likely to be distracted in a warehouse that is disorganized and dirty. Imagine the difference between trying to get work done at a desk cluttered with tons of irrelevant paperwork, trash from weeks’ worth of lunches and a computer caked with dust. Compare that to knocking out the day’s task on a machine without so much as a smudge on the screen, at a desk clear of anything that isn’t needed to get the job done. If you have a cleaner workspace, you will do more focused work. That definitely is true on a larger scale, as well. Dirty warehouses also deliver a message to your employees. Even though it might seem minor to have some dust on your shelves, enough minor oversights like that add up to a big, negative message. If it’s permissible for there to be a lot of cardboard on the ground, then employees, consciously or not, begin to believe that being lax in other ways is permissible, too. It’s a lot harder to take pride in your work when no one respects the appearance of the workplace. What’s more, when people work in an untidy environment, they tend to do untidy work. Clearly, warehouse cleaning is important, but like most things, it’s also easier said than done. Let’s take a look at some tips to get your warehouse cleaned thoroughly, efficiently and in such a way that it stays clean for a significant amount of time. The best way to keep your warehouse clean is to be sure that it is cleaned regularly. Designating specific days as cleaning days, rather than waiting until it looks the place really needs a good scrubbing, is one of the smartest ways to keep up with the cleaning. Be sure that you don’t just make one day a halfhearted token cleaning day to feel like you’re addressing the problem. Make a realistic assessment of how long a thorough cleaning will take based on how big the mess is and how many employees you have available to clean, and make your schedule from there. 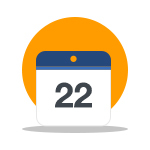 Don’t be afraid to assign multiple days as cleaning days to get the job done right. A big way to keep your warehouse clean is to never let it get too far out of hand. 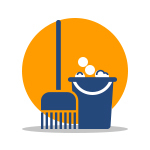 This doesn’t just mean that you should have monthly or weekly cleaning dates scheduled — although those aren’t a bad idea — but it also means that you should strive to instill a culture in which your employees care about keeping the place clean as much as you do. How do you accomplish this? Well, one simple way is to look at the amount of trashcans you have in your facility. Are there areas of your warehouse where someone would have to walk fifty feet to throw out a piece of cardboard? If so, chances are that piece of cardboard stays on the floor until your next scheduled cleaning. More trashcans make it easier for everyone to keep up with cleaning, so there won’t be as much work to do when the scheduled days come along. Another way to be sure that you stay on top of cleaning is to make “clean as you go” a requirement. In other words, make it clear to employees that cleaning up after they finish doing something shouldn’t be something they do in addition to the task, but rather something that is part of the task. No job should be complete unless the area is cleaned up afterwards. If a job leaves a lot of packing materials lying around, that isn’t a separate job for whoever does the warehouse floor cleaning. Cleaning up that mess should just be part of the unpacking job. Not everything should be left for the scheduled cleaning days. When the scheduled days do come along, make the job as efficient as possible by creating different cleaning teams who each have a different, specific cleaning task. 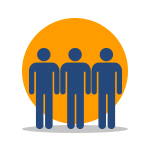 Try making teams of two or three people. One of those teams can go through first and be responsible for clearing out an area that needs to be cleaned. Next, another team can actually do the cleaning. One of the teams can be responsible for cleaning the floors, while the other can take care of dusting the shelves or picking up debris. Of these teams, the one cleaning the floor should go last so that they don’t have anybody after them soil the floor they just cleaned. Finally, a team should come through that is responsible for putting everything back where it belongs. You should take advantage of the fact that your inventory is being handled and moved around, and instruct this final team to also check the inventory for any expired or damaged products they can throw away. The best way for these teams to operate isn’t to have them just start on one side of the warehouse and move through the entire thing. Instead, take a look at your warehouse and divide it into four parts. Assign teams to each quadrant so that each section gets a team clearing space, cleaning and replacing inventory. The work will not only get done much faster with the warehouse divided like this, but it also will seem like a much less daunting task for each team involved. This will keep morale up because you won’t have everyone who gets assigned to a cleaning crew feeling like you have a personal vendetta against them. Just doing part of it will seem much more manageable and they’re more likely to do a better, more thorough job when they’re able to see the light at the end of the tunnel. Almost as important as making the teams and having them split the work up amongst themselves is also deciding what these teams should be cleaning with in the first place. Since you probably don’t have a pair of rivers nearby that you can divert, Hercules style, for your entire warehouse cleaning needs, you’re probably going to need to purchase a few key products. Yes, you’ve got brooms and rags, but a lot of the time simple tools won’t be enough to get the cleaning that you need. Let’s take a look at a few machines that not only can make warehouse cleaning easier, but can also get it done more thoroughly. The size of a warehouse almost makes having a warehouse floor cleaning machine on hand a necessity to getting your warehouse floor cleaner. Giving one of these machines to each of your teams will make your scheduled cleaning days go by even faster. First, you’ll want an employee to go through with a sweeper. This will pick up any loose debris and usually get a lot of the dust off of the ground, as well. 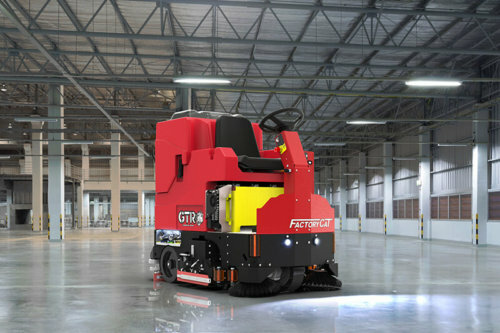 You have a few options for this kind of warehouse floor cleaning machine. You can get walk behind sweepers that employees can use pretty much as if they were lawnmowers. 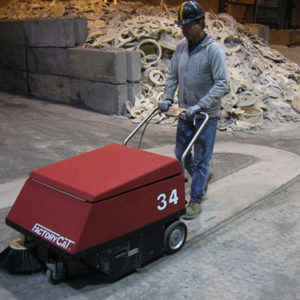 These walk behind sweepers are battery powered, making them perfect for cleaning inside the warehouse. But, if you want the cleaning to go even faster, you can invest in a ride-on sweeper for even more productivity. These ride-on sweepers can be battery, gas or diesel powered, and get a job done even quicker than a walk behind. If you’re spending too much time cleaning up a mess in your parking lot or the outdoor unloading areas, then you might want to look into chassis mounted parking lot sweepers. These sweeper trucks will get the job done swiftly and thoroughly, and are able to operate in even the worst conditions. After you go through the inside with the sweeper truck, it’s time to make the floor shine with a warehouse floor scrubber. As was the case with the sweeper, you have a few options with the warehouse floor scrubber so that you can match the machine to your needs. You can get smaller, walk behind scrubber if you have a lot of tight spaces in your warehouse. Alternatively, you can opt for the ride-on if you’re confident that you’ll have the space for them to operate effectively. But just because it’s a ride-on doesn’t mean that the scrubber has to be the size of a street sweeper. These come in a variety of sizes, from compact, to mid-size to large. After using one of these machines, you’ll never even think about ordering an employee to spread some dirty water around the floor — also known as mopping — again when you want your warehouse floor cleaner. Another option is to acquire a warehouse floor sweeper/scrubber combination machine. These warehouse cleaning machines, as you might be able to guess, do the job of both the sweeper and the warehouse floor scrubber. This removes the need for someone to make a pass through with the warehouse on two different machines, cutting down on total cleaning time and saving you money. Like the other warehouse floor cleaning machines, these are available in walk behind and ride-on models, with the ride-on models available in compact, mid-size and large. These just might be your best option if you’re very concerned with how much time your employees spend on cleaning. Now you’re ready to go forth and clean your own Augean stables. Though it isn’t the most glamorous job in your list of responsibilities, it’s still crucially important. Now you know how to get it done with mythic efficiency. 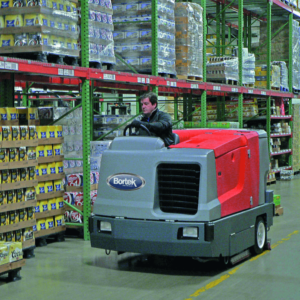 To help in all your warehouse cleaning machine needs, contact Bortek Industries™.